Mariuca's Perfume Gallery: Double Contest! Emila and I love being Santa Claus! In other words, we love giving presents to our friends. It makes us happy to see the smiles and joy on the faces of our friends when they receive something special from us. I guess it's no surprise then that we're both having a contest at the same time! The Mariuca CNY Mug Contest is now running at my other blog and Emila is currently hosting her 5th giveaway! 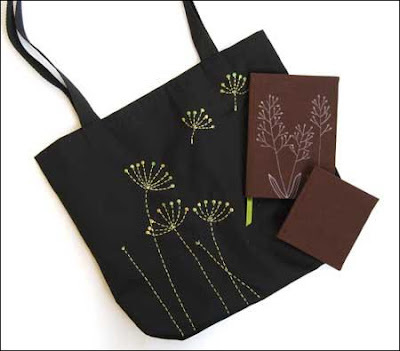 Check out this cool set of tote, blank book and notepad she's giving away to one lucky winner. To enter, just vote for Emila's Dont Panic Momiji Dolls, and you’ll be in the running to win this set of handmade items! Simple right? Emila is a gifted and upcoming artist in the local arena. For more details on her 5th Giveaway, visit Emila's Illustrated Blog, where you'll also find an amazing collection of other Emila Originals. Stop by today to see more wonderful work from this creative talent and I'm sure you'll agree that she's worthy of your vote! Hihihi! I love you so much! Thank you for helping me spread the words! And thank you for your vote! GP! I voted already.. and have also posted the badge at my blog..
Great LJ! I wonder what's the prize that Emila is in the running for with this momiji dolls contest! ;) Happy weekend LJ! haha marzie, I can't believe it you still have this banner! Nasib i tak delete from the banner from server! I love Emila's totes... fantastic! !